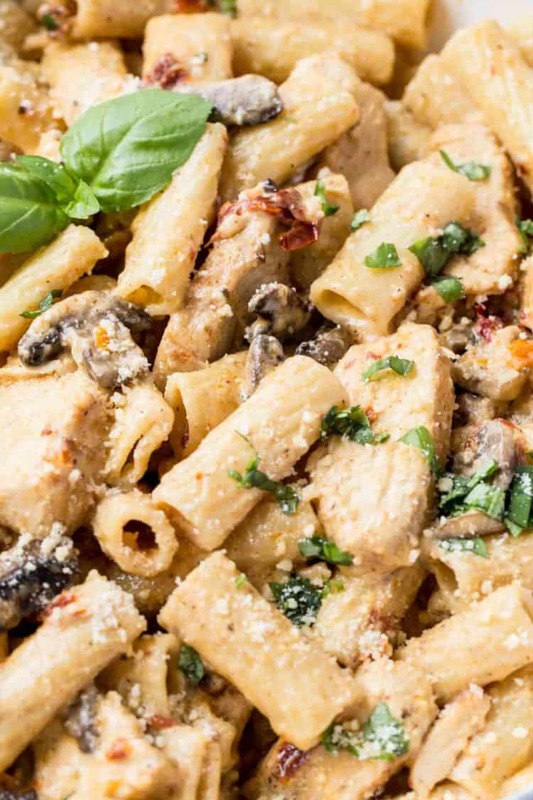 This creamy Mushroom Chicken Pasta Recipe is so addictive and ready in under 30 minutes! 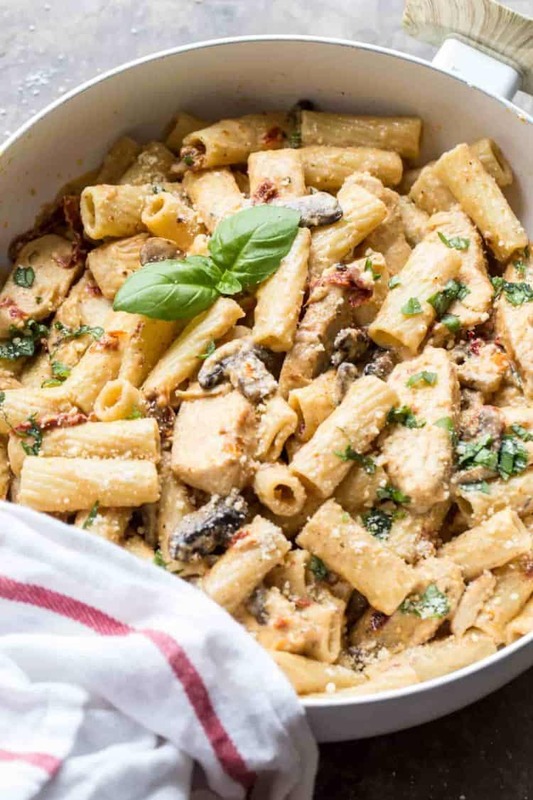 Tender chicken with sauteed mushrooms in a creamy sun-dried tomato sauce with rigatoni pasta. Serve this pasta with a simple Spring Salad and Homemade Bread to complete the meal. Pasta dinner is a favorite of ours for comfort food. It’s easy to prepare and is so filling and satisfying. This pasta is no different. Flavorful and tender chicken breast, mushrooms and a creamy sun-dried tomato sauce with rigatoni pasta. The secret to this recipe is the hot sauce that’s added to the sauce. It gives the pasta a bit of a kick but isn’t overpowering at all. Just the right amount of spice to make the pasta stand out and be original. This pasta is a great option to prepare and serve if you are looking for a quick dinner with minimal work. This dinner will make you feel like you’re in a fancy Italian restaurant for a fraction of the price. Meanwhile, season and cook chicken breast. Saute mushrooms. Add garlic and sun-dried tomatoes and chicken to the skillet. Drain pasta and add to skillet with remaining ingredients. If you are looking for a non-stick cooking skillet, THIS one is great and has a lid! 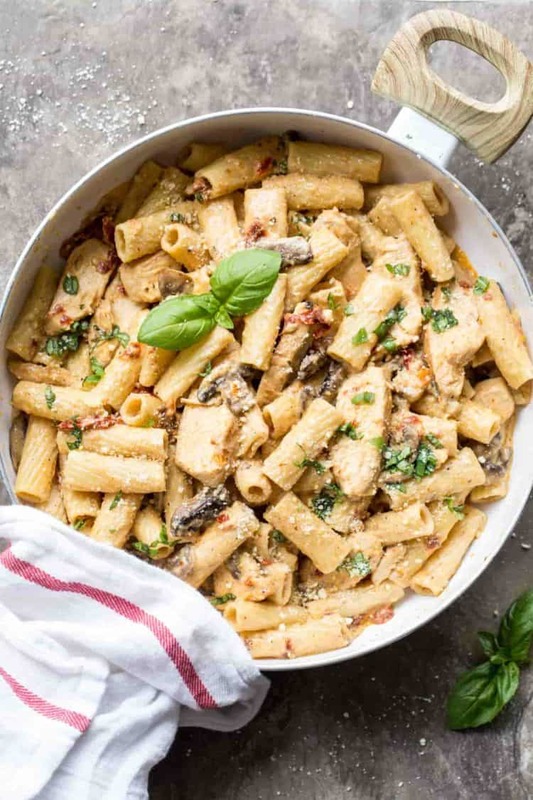 Though rigatoni is my favorite choice of pasta for this recipe, you can substitute for rotini or penne pasta if that is all you have on hand. Any canned sun-dried tomatoes in oil will work. Be sure it is canned and you aren’t using the dry tomatoes. Dry tomatoes will be hard and unpleasant. For this recipe, we used white mushrooms. However, portabello mushrooms also work wonderful and give the pasta more flavor! Can I reheat the Creamy Chicken Pasta? This chicken pasta is great if served as leftovers. Melt butter in a skillet and reheat pasta. You may need to add some heavy whipping cream and seasoning if the pasta is too dry. Chicken Scampi Recipe– an Olive Garden CopyCat recipe. Pasta and Meat in Skillet Recipe– So quick and easy. Chicken Mushroom Fettuccine Alfredo– Classic Alfredo recipe. 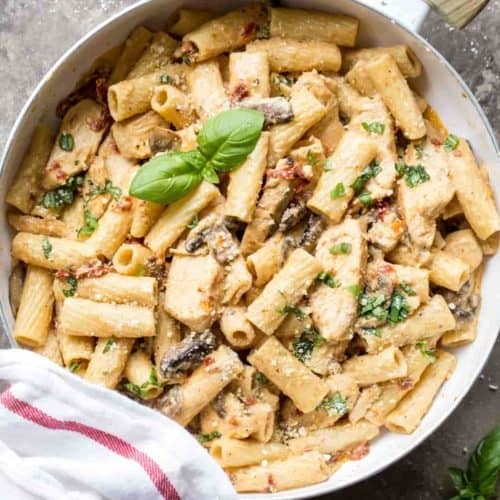 Creamy Mushroom Chicken Pasta Recipe in 30 minutes! 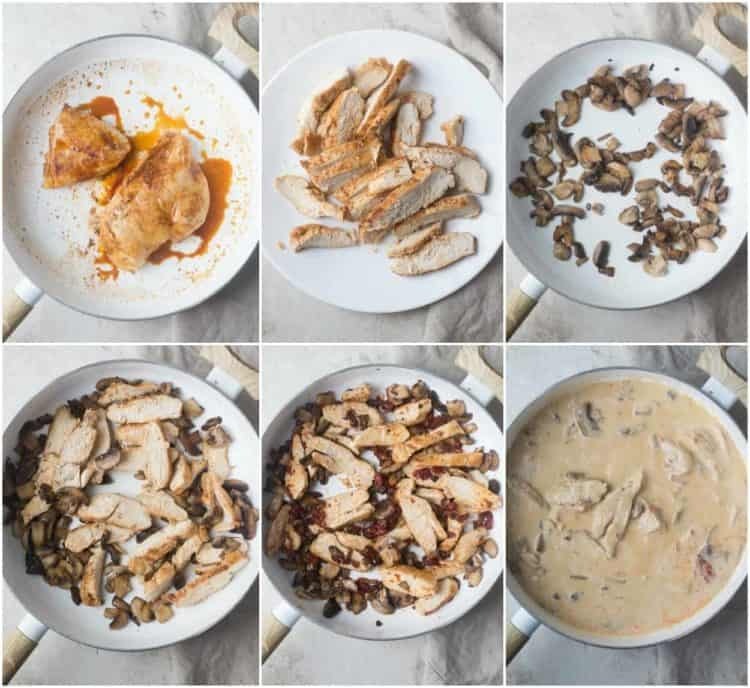 Tender chicken breast with sauteed mushrooms in a creamy sun-dried tomato sauce and rigatoni pasta. Cook pasta per instructions, al dente. Drain and cover to keep warm. Meanwhile, combine the ingredients for chicken seasoning in a small bowl. Lightly beat chicken breast with a meat mallet so the breasts are even in thickness. Season chicken breasts on both sides. In a large skillet, over high heat, heat oil. Once hot, add chicken and sear 2 minutes per side, until crispy. Turn down heat to low, cover skillet and cook another 5 minutes. The chicken will become tender. Transfer chicken to a plate and cover to keep warm. Once chicken cools a bit, slice into thin strands or cube. In the same skillet, over med/high heat, sauté sliced mushroom with 1 Tbsp butter, lightly season with salt and pepper. Add garlic, 3 Tbsp butter and sliced chicken to mushrooms, cook for another minute. Drain and finely chop the sun-dried tomatoes. Add the tomatoes to the skillet and mix well. Add broth, heavy whipping cream, parmesan cheese, hot sauce and seasonings for the cream. Stir until well incorporated and cook over medium heat until sauce thickens, continue stirring as needed. Add cooked pasta to skillet, mix and bring to a simmer, cook another minute. This is such a great recipe for family & friends. So easy to make & so so so delicious! What a great recipe. You are so talented Valentina! Thanks so much, Angelica! I’m so glad you enjoyed the pasta recipe. Thanks for visiting our online home. We went on a cabin retreat and had this for dinner, it was by far my most favorite meal. So many flavors that just come together to make the best meal!